Product update gives radiology users real-time insights into workflow efficiency, system usage and ROI. Recently, the radiology industry has pushed for deeper analytics and data measurement in its pursuit of better patient health outcomes. Accelarad has answered that call with our new dashboard and first-of-its-kind reporting details. 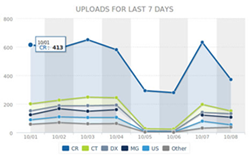 Accelarad, the nation's leading cloud-based medical image sharing solution, announces a major product update, which includes the industry’s most advanced image exchange analytics reporting and a new user interface (UI). Now, each Accelarad customer has access to a real-time analytics dashboard, with options for more complex and custom dashboard options based on subscription level. "We’re excited to unveil our latest product update at the Radiological Society of North America’s 2013 annual meeting," said Willie Tillery, CEO of Accelarad. "Recently, the radiology industry has pushed for deeper analytics and data measurement in its pursuit of better patient health outcomes. Accelarad has answered that call with our new dashboard and first-of-its-kind reporting details." 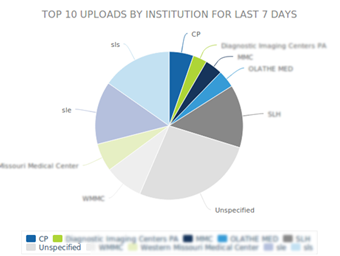 Accelarad’s medical image exchange users can now self-select timeframes to quickly review the number of studies shared and received as well as top activity from image viewers. These measurements provide insights into workflow efficiency; for example, administrators can see which physicians and/or hospitals are using the system to view images and determine which doctors might need training. In addition, users can accurately measure a facility's number of scans, determine peak times and trends in referral patterns to gauge revenue loss or gain. Moreover, the dashboard demonstrates true ROI by detailing the number of compact discs (CDs) eliminated by transitioning to an electronic online process. "Our medical image sharing app’s new design will give our customers – both patients and providers – a more user-friendly experience while still providing the quick and secure solution they’ve come to rely on," Tillery added. Click here to learn more about Accelarad’s latest technology update or visit booth #5119 at RSNA 2013 to demo the product. Founded in 1999, Atlanta-based Accelarad, creators of SeeMyRadiology.com, is the nation’s largest medical image exchange. The cloud-based solution makes it simple for healthcare organizations, physicians and patients to securely view, manage and share medical images and documents online. As a result, Accelarad enables healthcare providers to reduce CD usage, increase efficiency and improve patient care. To date, seemyradiology.com is used by more than 1,700 facilities and thousands of patients and physicians who share nearly half a billion images annually. Further demonstrating the company’s market penetration, in 2013 Accelarad was named "Top-Ranked Medical Image Exchange Vendor" by leading healthcare technology research organization, KLAS in the report Image Exchange 2013: A Close Look at Accelarad, November 12, 2013. For more information, visit accelarad.com and accelarad.com/connect-america and follow @Accelarad and @_ConnectAmerica on Twitter.